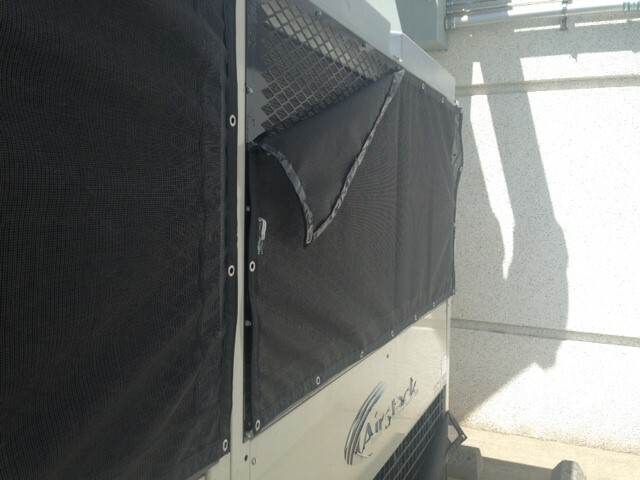 The image to the left is of an air-handler that sits behind a building at a major sportswear brand corporate office located in Beaverton, Oregon. Surrounding this area, is a big cinder-block wall that creates a wind tunnel around these air-handlers. This wind tunnel acts almost as a vortex that swirls around environmental debris. 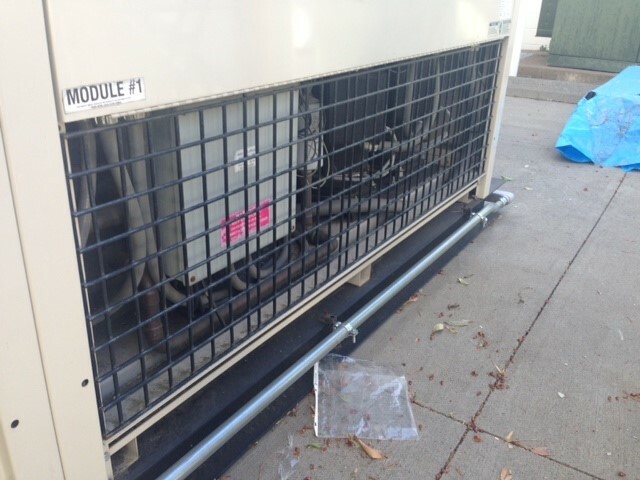 Not too far from the air-handler is the garbage area. The debris from the garbage area blows around and gets sucked under the equipment into the air intake and in to the hard to reach coils. This creates a difficult cleaning situation. 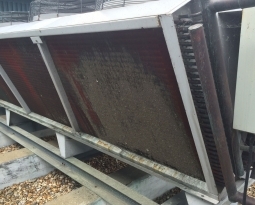 The sportswear brand’s facility manager contacted Liam Hayes of Total Filtration Services in Portland, Oregon for a solution to their HVAC problem. 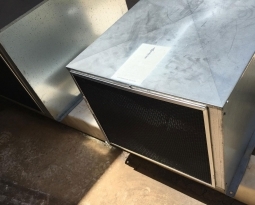 Hayes suggested installing a PreVent® Air Intake Filter, Model BHA. 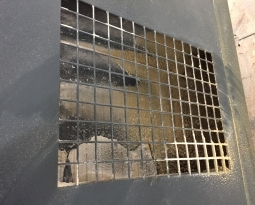 These air intake filter screens are designed to act as a primary pre-filtration defense to help prevent damage and extensive maintenance that large volumes of debris can cause. 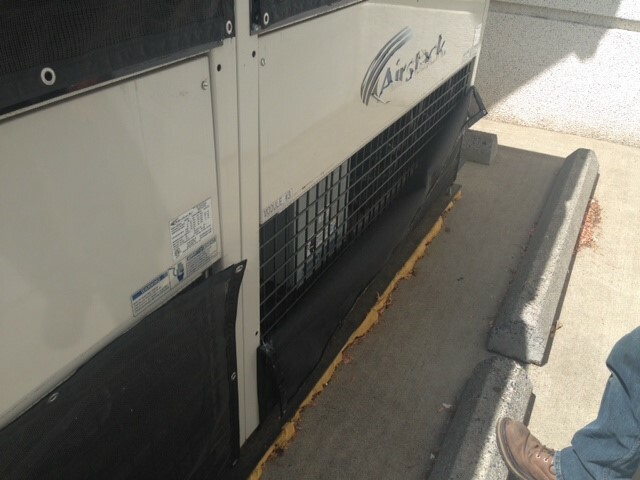 Each filter was custom designed and manufactured to fit the exact perimeter of the air intakes. Model BHA filter is constructed of black PVC coated polyester high abrasion media encased in a sewn vinyl edge, with steel grommets for easy and secure installation. This filter, designed for strength and durability, is UV protected, stands up to extreme outdoor exposure, corrosive chemicals and high velocity air flow. 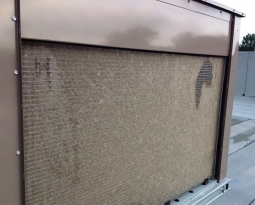 Filters can be cleaned easily as needed, simply brush off debris with a stuff broom or shop vac. The customer could not be happier with the results; take a look at some of the installation photos below!